Benadryl, also known as Diphenhydramine hydrochloride, is presented as the key armament in the war against allergies in a television commercial filled with special effects and clever sound design. 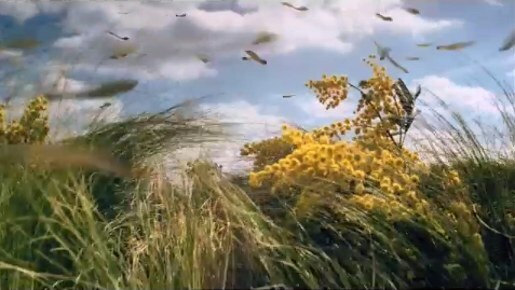 In a scene reminiscent to the opening shots of Apocalypse Now, we see dragonfly choppers deploying pollen bombs, whilst spores and seed pods explode in unison to mark the dangerous onset of the summer season. The Benadryl War Against Allergies campaign, waged on behalf of McNeil-PPC, was developed at JWT London, by creative director Russell Ramsey, art director Andy Smith, copywriter Ryan Lawson, agency producer Anna Church, planner Ian MacDonald, account director Will Kirkpatrick. Filming was shot by Steve Cope via Rattling Stick, London with producer Kate Martin. Editor was Tim Hardy at Cut + Run. Post production was done at The Mill by 3D artist Aidan Gibbons and Flame artist Gary Driver. Sound was designed at Grand Central London by Munzie Thind.